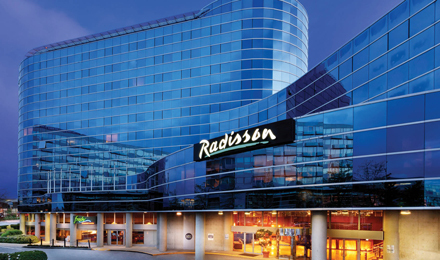 Relax in style while staying in Addison, TXOur 101 spacious hotel rooms and suites at the Radisson in North Dallas offer indulgent mornings with BD Imports coffee and restful nights with plush beds and Ritual bath amenities. Store and heat up snacks with the refrigerator and microwave, or kick back and watch a show on the cable TV. If you’re interested in added space and upgraded amenities like a dining table and garden tub, reserve one of our King Suites. Enjoy an attractive room with two queen beds and all standard amenities when you choose the Double-queen Room. After a busy day, spread out and relax on a king bed in this spacious room featuring all standard amenities plus a sleeper sofa. Give yourself and your travel companions extra space with the King Suite, which includes a king bed, a dining table, and a garden tub and a separate walk-in shower in the bathroom. All standard amenities and a sleeper sofa are also provided. Sample delicious American cuisine at our on-site restaurant and barThe Radisson in Addison, TX makes dining both delicious and accessible at our on-site restaurant and bar. Open for breakfast and dinner each day, the restaurant serves all-American favorites and a wide selection of beer and wine from the bar. In a hurry? You can grab snacks and other essentials at our convenient sundry shop, located behind the front desk. If you’re craving a quiet meal in your comfortable room, simply order room service. Mon-Fri, 6:30-9:30 a.m. and 5-10 p.m.
Sat-Sun, 7-10 a.m. and 5-10 p.m.